Kahana is a State Park located near the top of the windward coast of the island. It is a remote lush valley surrounded by tall ridges and fronted by a mile-wide beach and bay. One of the ridges over the bay faces the tradewinds, and provides consistent ridge soaring over one of the most beautiful undeveloped vistas on the island. The lift is mostly ridge lift, with the possibility for some gentle thermals mixed in. On the right days, this is a great site for new local pilots and low airtime visitors, and it also offers some easy cross country trips with a mixture of ridge soaring and thermal flying for new XC pilots. The back of the valley is the rainiest spot on the island, which explains why it's so green and lush, and also why we often have low clouds and rain squalls blowing through. This is our only permitted and insured site. USHGA membership and a signed club waiver are required. Our site agreement with the State Park requires USHGA membership and a signed club waiver, and you must also be accompanied by a local pilot when you fly here. Do not park at the boat ramp - park at the Camping Area lot if it's not crowded (second on the right coming from town) or at the inside lot (across the highway from the beach), or at the trailhead. Alcohol may not be displayed or consumed in the Park. Wind can be strong on launch (15-20+ mph) and will require good high wind launch skills and a speedbar. No matter what the actual direction of the wind it will flow crossways over the launch ridge, so be ready to turn into the flow when inflating. When the wind is strong on the upper launch the lower launch can work better. When the direction is more NE, the inside launch ridge will get rotor from the wind shadow of the north ridge, so it's often better to launch the North launch on those days. If you don't get up immediately from the low launch or the North launch, head immediately for the beach LZ - there are no alternative bomb-out LZs from those launches. Or if you are getting low after launching from the upper launch, head for the beach as soon you get below the low launch. Stay out of the little valleys between spines on the ridge when the wind is stronger, to avoid rotor and mechanical turbulence. When the direction is E, watch out for the venturi around the north side of the ridge when you're low - many pilots have been sucked around there unable to get back, and were forced to pick a pasture LZ around the corner. On E days the entire E face of the Kahana ridge will generate lift, but on NE days, only the front of the Kahana ridge will generate lift and the E face will be a venturi of sinking strong wind. On stronger days the wind accelerates around the surfaces of the ridge and especially at the summit - pilots generally stay low and out front on those days. Avoid flying over the valley - it is a swamp and generates no lift, but can often see a valley wind that will keep you from getting out of there if you are low. Our official landing zone is the clearing between the trees at the center of the beach. Avoid setting up any portion of your landing over the trees since the venturi effect or occasional valley wind can drastically reduce your chances of avoiding a tree landing. Instead, lose your altitude over the boat ramp corner of the bay and when you are at tree height (around 100 feet) begin your base approach leg along the surfline towards the center of the beach. If the center of the beach is crowded, choose another open area - pilots must yield to other park users. This also applies to folding up - if the usual grassy area is crowded with campers or beachgoers, find another spot. There are plenty of alternate spots available. If the wind is strong and E there can be mechanical turbulence washing over the LZ from the other side of the bay, made visible as they approach by cats paws on the water. In these conditions it's better to try to land on the boat ramp end of the beach, or just skip the normal LZ and head downrange to land at a beach with cleaner exposure to the easterly wind. On lighter days when cloudbase is reasonably high, the options for cross country trips are numerous. We will head downrange (NW) on the more easterly days, hopping across the valleys and working the ridges, sometimes in ridge lift and sometimes in strong thermals. There are numerous beaches and fields available for landings. Be aware that on stronger days the venturi effect at the ridge tops and valleys is strong and you'll need to stay way out front of the terrain. Also the wind tends to accelerate the farther downrange you go as the mountains shrink into foothills and veer inland - so leave lots of upwind leeway as you set up for landings. On the occasional days when the wind is more northeasterly we'll attempt to cross the bay and head uprange (SE). If you get low on a bay-crossing attempt be aware there are no good landings on the other side -- you need to leave enough altitude to make it back to the ridge or at least to the central beach LZ. Pilots have made it as far as the beach at Hukilau/Malaekahana in Laie (7.5 miles downrange), and as far as possible in the other direction - to Makapuu at the easternmost tip of the island (22 miles uprange). 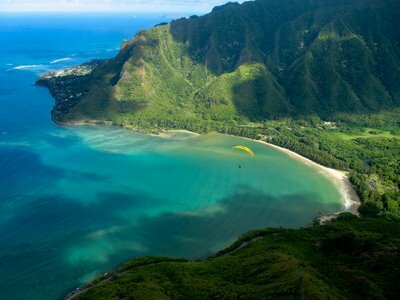 Kahana was first flown by hardy hang glider pilots around 1985, then by paragliders in 1992. Jon Goldberg-Hiller flew a paraglider there first, from the official hiking trail ridge. Later on, pilots hiked almost to the summit and launched from high up above the north ridge to soar on light northerly days. Chris “Mad Dog” Pliska pioneered the current launch and trail which saved a lot of hiking and worked on more easterly days. Later, Troy figued out that we could use the low launch (lolo launch) on strong days, and later he pioneered and groomed the current North launch. By 1999 or so the site was flown regularly by an increasing number of paraglider pilots until early 2001, when the DLNR began to enforce their rules against launching or landing on state property without a permit. After a year of proposals and discussions with state and community groups, the club was granted a permit to resume flights there under specific terms as set forth in the permit, beginning in early 2002.